Kroke is a klezmer band. Are you thoroughly confused yet? Klezmer is music for dancing with a partner. It doesn’t bounce; it flows, it swings, it cries. It is safe to say we are dealing with a style of music, but defining that style would be as difficult as finding all the Jews in the diaspora. It is probably fair to say that klezmer is a music that expresses deep emotion around the joy of life, but Jewish culture rarely lets you know about that joy without also taking note of the trials and the sorrows as well. Think long, sinuous, minor-key, violin-carried melodies wending their way over a toe-tapping, thigh slapping, hip-shaking beat – a beat that sometimes accelerates and seems to be running away in ecstatic joyousness. In the last twenty years or so there has been a major revival of interest in klezmer music both in Europe and in the United States. As might be expected, young practitioners bring their own interpretations to the traditional sounds and the tradition continues to evolve. This is totally appropriate for such cross-cultural folk music expression. 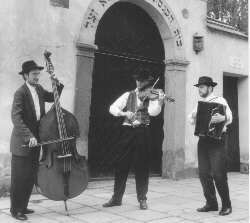 Kroke is a klezmer band from Krak�w, Poland, which is, in itself, a statement riddled with implications. Krak�w was taken by the Germans at the beginning of World War II. The German governor executed the university’s teaching staff and sent some 55,000 Jews from the city to the Auschwitz II (Birkenau) death camp. Krak�w, like Warsaw, had had a flourishing Jewish cultural life before World War II; the Holocaust left a mere shadow of what had been. A klezmer band from Krak�w is like a flower growing from the ashes. The Sounds of the Vanishing World is an extraordinary cd. There is no question that you are listening to klezmer, but it is a very contemporary interpretation of the tradition. Three musicians play a variety of instruments: violin, viola, accordion, flutes, double bass, mandolin, bells, a variety of percussion, and occasional vocals – but without lyrics, the voice used as an instrument. At various times, there are sounds that suggest Piazzolla’s bandoneon, belly dancing music, Turkish muezzins. The opening cut, "Earth," offers a rich sound of accordion, the viola picking up the line, anchored by the solid bass. Simple melody lines are repeated with minor variations in a series of interesting, dissonant harmonies. "Air" suggests just that – an ethereal sound from the viola and accordion, the bass omitted. "Question" is a solo for the double bass, distinguished on that count alone, and a very mellow sound. "Time" is one of the best cuts on the disk. A ticking clock starts the number and continues throughout with a softly wailing accordion passing the melody along to the other instruments, a flute coming in late in the game, until it fades back to the ticking clock and ends with a series of birdcall-like sounds from the flute. "Dance" is a fast, syncopated, multilayered sound that will keep you tapping that toe. "Fire," "Water," and the eponymous closing number all get into a mid-Eastern sound, more Turkey than Poland. The percussion is strong, there is that sinuously winding melodic line, and vocal elements add to the mix. While Kroke picks up on a variety of the many klezmer historical strands, it integrates contemporary influences as well and ends up being its own distinctive sound – original and beautifully exotic.